I’m absolutely delighted to be blogging this week about an award win for one of HMRC’s Digital teams. 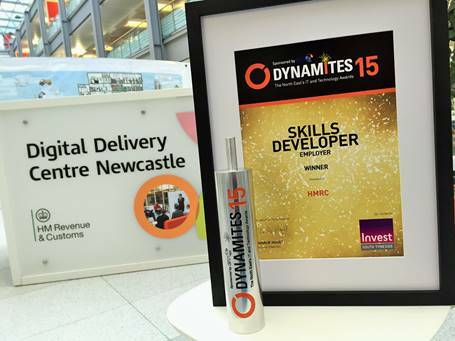 The HMRC Digital Delivery Centre team in Newcastle was nominated for the Dynamites 15 awards. The awards are in their second year and they recognise and showcase the IT and Technology industry in the North East. Our winning team was nominated in the Skills Developer - Employer category. We’ve made it a priority to develop opportunities to introduce new talent into HMRC and find and bring on talented people already in the organisation to build an in-house digital capability and create meaningful IT and technology careers. It’s a really great feeling to see that recognised at the awards. Congratulations to all the team, I’m very proud of your success.